Taking time out of his busy schedule, this third-year sat down with the Communications Team in the Ohio Union to tell us about his challenging experiences here at The Ohio State University thus far. We have no doubt you will find this future lawyer’s story as extraordinary as we do. LeRoy shared that he looks up to Marshall and that this quote applies to his own life experiences. Seeing Thurgood Marshall’s influence on the legal field, LeRoy plans to continue on a similar path to create the change he wishes to see in the world. His only solution is to get involved. 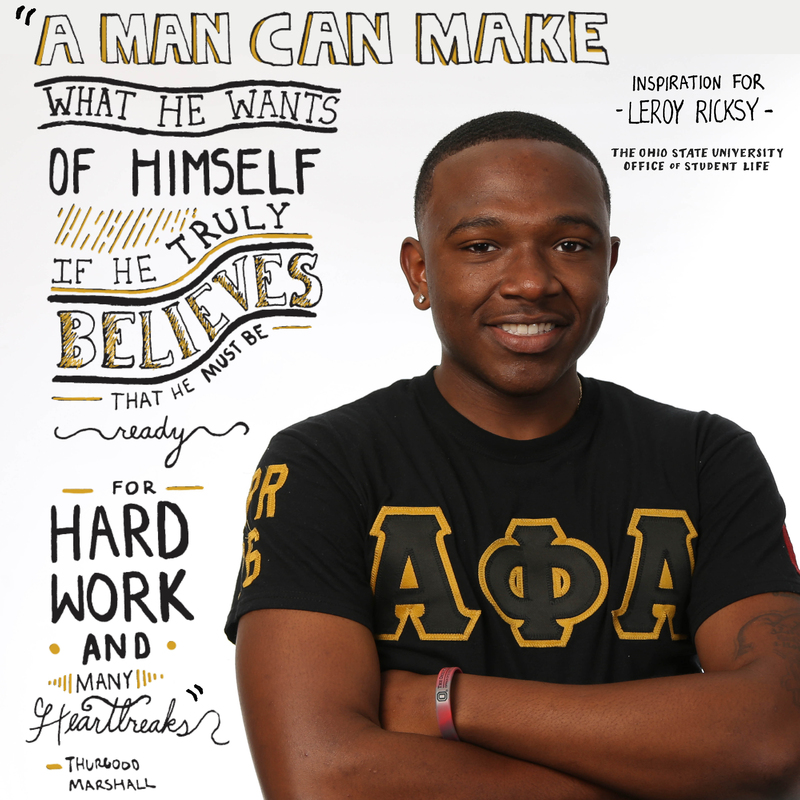 LeRoy serves as an Inclusion Advisor for the Undergraduate Student Government (USG) on campus. Bridging the gap between student organizations and USG, LeRoy works to raise awareness amongst student organizations about the resources available to them. In addition to his role in USG, LeRoy also serves as President of the student organization Band of Brothers. This student organization focuses on providing resources and space for the development of African American men on campus. Continuing on with his involvements, LeRoy talked about his active role as a Diversity Ambassador, a member of the Department of Social Change and a member of the Bell National Resource Center. Ready for the work ahead, LeRoy explained how he wants to help others get to where he is, because he didn’t get where he is on his own. As a black male on campus, his journey at Ohio State has presented challenges, but is getting easier. Resources like the Frank W. Hale Black Cultural Center, the Black Student Association and Band of Brothers have made it easier for him. “With everything going on today in the news, it’s hard for me to walk in a classroom sticking out like a sore thumb, and trying to understand what others’ thoughts are of me,” LeRoy said. With these thoughts in mind, one way LeRoy gives back to Ohio State is through outreach efforts to black children in urban communities with his work in the Department of Social Change. LeRoy said that he is most proud of his involvement in planning and coordinating the department’s annual event, A Day in the Life of a Buckeye. This event has been transformational for LeRoy, and he enjoys seeing how he can make a difference. LeRoy served as a host his freshman year, answering questions and providing guidance. Today, the student he supported back then attends Ohio State. LeRoy describes himself as passionate, silly and impactful. Responding to Thurgood Marshall’s sentiments of heartbreak, LeRoy shared that accepting failures has been one of the hardest lessons he has learned at Ohio State thus far. As salutatorian of his high school, LeRoy talked about the difficult transition of coming back from setbacks. Crossing off his recent study abroad experience to Oxford University in England, we can’t wait to see what he’ll do next. Posted by Thea Dellas at 2:22pm Bookmark the permalink.